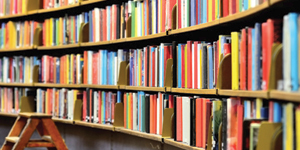 Though this is the age of digitized books and periodicals, we don’t see any decrease in the number of students visiting the library and using the books for reading them. Level four of the Primary building houses a huge, quiet, spacious, colourful and full-fledged library with a wide spectrum of approximately 7000 books, catering to different genres. The library has earmarked areas for both junior readers and senior readers. The colourful, fairy-tale theme based library with books on fiction, non-fiction, documentaries, biographies, periodicals, encyclopaedias, Literature, Science, Humanities & Social Sciences, Technology, Psychology, Arts & Recreation, Essays & Speeches, etc. 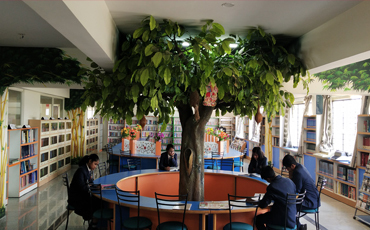 facilitates children for a quiet reading session at their own pace and it has been observed that this place is the most loved and frequently visited area by the children. The library books are stored in steel and wooden cases. It follows the principle ‘Library automation’ with the software to collect and distribute the resources. This new-generation of automated process of resource portals has managed the index formation relating the web links to the book records and to the library catalogue and so on. Our library is used by our students and teachers to get themselves prepared for their next class/class-test, home assignment, term-assessments, general information, for intra and inter school competitions which would be more academic oriented, information for reinforcement and for recreation.